It’s been an effort nearly four years in the making, but Danish duo Quadron is ready to find the spotlight with their first releases in the United States. Their song, “Hey Love”, will be serviced to Hot Adult Contemporary radio during the week of May 20, followed by an album, Avalanche, which is out two weeks after that. They’ve already been a minor success in their home country; now, the two looks to dance into our hearts with their soulful sound and shakin’ steps. The duo consists of singer Coco Maja Hastrup Karshøj (also known as Coco O.) and producer Robin Hannibal, who were introduced to one another back in 2009. Their name, Quadron, is a variation on the 17th-century racial term quadroon (a person who is of 1/4 black ancestry), which isn’t generally used today except for in historical texts because of the implications of it. However, since both members are indeed 1/4 black, they thought it would be fitting. The music, a mix of electronic and soul, has seen attention from several major publications. Though they haven’t been an instant success as a duo, they were recently inked to an American deal with Epic Records and their sub-label, Vested In Sound in the midst of some big developments. Karshøj is featured as a guest vocalist on Tyler, The Creator‘s most recent album, Wolf, and her solo song, “Where The Wind Blows”, is featured on the soundtrack to The Great Gatsby. Hannibal is also a member of the indie duo Rhye and they released their debut album, Woman, here two months ago. So, if this gig doesn’t work out for the two of them, it looks like they’re firmly rooted over on this side of the world. However, I’d like to think they’ll do at least a little something with this song. “Hey Love” is their first ever song to be released here, and it’s a good one. Mixing a simple pop sound with the edge of a 50’s R&B record produces a beat that gets your hands clapping and toes tapping. Plus, Karshøj has an interesting tone to her voice, which has a seductive way about it. She sings, “Promise the best is yet to come/Oh, please tell me the truth/When will the two of us be one?/Oh, please tell me the truth/So I can prove that I’m the one.” Sounds like she’s in deep with her lover, although she does feel the need to question the emotions she’s going through to get to her conclusion. The music video provides an interesting visual of the lead singer dancing around in different styles and outfits with her different suitors, but like any good party, it ends in a Soul Train-inspired dance line, not that that’s a bad thing to end with. 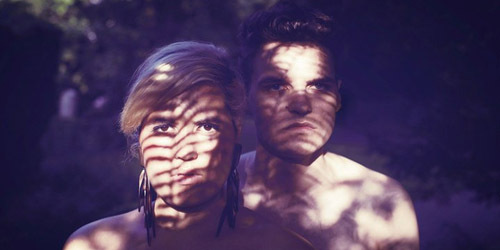 It follows other clips like “So Pure” by Alanis Morissette or “Safe And Sound” by Capital Cities which have slightly similar concepts, but the duo hold down their own style, both musically and in their public image. Should the two singers hit the Hot 100, Quadron would become the first all-Danish act to hit the chart since 1998, when a female duo, S.O.A.P., rose to #51 with their only charting single, “This Is How We Party”. It was the last in a string of acts from Denmark to hit the charts during that period, which included the quartet Aqua and the trio Los Umbrellos. Other Danish duos to hit America on various surveys include two all-male acts: Laid Back with “White Horse” (#26 Hot 100, 1984) and Junior Senior with “Move Your Feet” (#25 Dance/Club Play, 2003). This isn’t to say that there are no Danish groups on the charts today; in fact, a metal band at #2 on Active Rock radio, Volbeat, is originally from there. However, it’s a pretty rare occurrence, so kudos to them on trying to break this tough market. It may a gamble that their label will have to take on a format that’s leaning increasingly more CHR-driven, but there’s nothing like a boogie down into the summer and fall. So, say “hey” to these newcomers, because it may just be a while before you say “goodbye”. Let me know what you think of this new song and act in the comments or on Twitter: @AdamFSoybel. Watch the video for “Hey Love”. / Purchase “Hey Love” on iTunes. / Pre-order their debut Stateside album, Avalanche, on iTunes. Tagged as Aqua, Avalanche, Coco O., Denmark, Hey Love, Junior Senior, Laid Back, Los Umbrellos, Quadron, Robin Hannibal, S.O.A.P.